Electronics & Instrumentation Engineering: 60 seats. The aim of the Department is dedicated to prepare Instrumentation Engineers to suit the modern automated industries where the instrumentation plays a great role in such industries. In automated plants of the automated industries various parameters are measured in real time. Hence, this branch of engineering has great importance in all other branches of engineering. 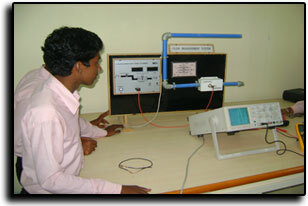 The Department has an excellent Instrumentation/Process Control Laboratory, to cater to the needs of students at a time. 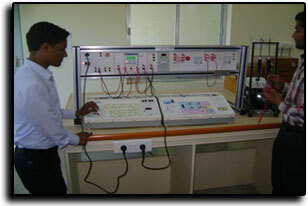 It has its own Sensor & Signal Laboratory, Measurement, LabVIEW Simulation Laboratories. The laboratories are well-equipped with adequate number of hardware, trainer kits, oscilloscopes, and function generators to give a firsthand training on Industrial automation. 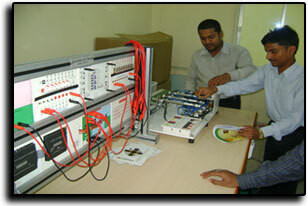 The circuit simulation is carried out with latest software like Multisim, PSpice, Circuit Simulator and LabVIEW. The department of ECE,E&I engg. has conducted a workshop in LabVIEW. National Instruments LabVIEW is a powerful development environment for signal acquisition, measurement analysis, and data presentation, giving you the flexibility of a programming language without the complexity of traditional development tools. Typically, measurement and automation applications can be broken up into three primary pieces – acquiring data, analyzing it, and then presenting it to the enterprise. LabVIEW, designed specifically for scientists and engineers, has built-in tools to rapidly design these applications. In addition to the LabVIEW development systems, National Instruments offers a variety of add-on modules (e.g. LabVIEW Real-Time Module, LabVIEW FPGA Module) and toolkits (e.g. Sound and vibration, PID control) which extend the functionality of LabVIEW. These tools save you valuable development time and help you efficiently meet your application challenges. Engineers and scientists implement NI LabVIEW applications in many industries worldwide, including automotive, telecommunications, aerospace, semiconductor, electronic design and production, process control, biomedical, and others. The flexibility and scalability of LabVIEW make it well-suited for initial research and design phases all the way up to large scale manufacturing test processes. By using the single, integrated LabVIEW environment throughout the phases of the design cycle to interface with real-world signals, analyze data for meaningful information, and share results and applications, you can boost productivity throughout your organization. Difference between LabVIEW and MATLAB is that MATLAB has no real time data processing. MATLAB first store, then process the data whereas LabVIEW can perform real time data processing. For this reason LabVIEW is very powerful virtual instrumentation software in signal acquisition, measurement analysis, and data presentation.